How do you store your media while on vacation? Here are the gadgets I used without breaking my back. Using technology on vacation is very tempting. I thought about borrowing a laptop to haul down to Florida, but imagine hauling that around. Yikes! You need to relax and enjoy yourself, but you want a sufficient amount of techie stuff to get the job done. I might add that taking too many gadgets on vacation may upset your better half as well. However, I didn't want to be left with a ton of pictures to take and no SD cards to write to. I wanted to "capture the moments." In the computer industry, there is a saying: you can never have too much memory or hard drive space and this vacation was no exception. My family and I were on vacation for the last two weeks. For most of those two weeks, we spent our time at Disney in Orlando, Florida. LOVED IT! Before we left, I needed my digital camera for the trip. My wife had a digital camera, but the camera couldn't use any of the Secure Digital (SD) cards that I had. I already had a Canon PowerShot SD600 Digital Camera, so this was the logical choice for the vacation since it was small and portable. Since I had my Canon Digital Camera, I needed some large SD cards. 2GB or higher were preferred because not only did I want digital photos, I wanted some digital video. I had four 2GB SD cards. I needed a couple more, so I bought two more for $10 a piece (After rebate, of course). Where to store my portable media? Once you have your photos and video captured, where do you store them so you can reuse your SD cards? You can take a laptop with you, but I didn't have one available at the time. Ok...Plan B. Mobile storage was the way to go, but what to get? After looking around, I found the answer to my problem: Teac 40GB Multifunction USB 2.0 Portable Photo Storage Drive . Don't let the name fool you because it has the words "Photo Storage" in the product name. It transfers any kind of files from a Flash Media source to its internal hard drive. The Teac 40GB multifunction Portable Storage Drive supports the following media: SD, MMC, Memory Stick, MD, CompactFlash, and SmartMedia. After I filled my SD cards, at the end of the day, I would turn on the portable drive, insert one SD card at a time, and press copy. It would transfer everything from the SD card to the Teac 40GB hard drive. When I first looked at the device, one thing bothered me. When it copies the files from the media to the hard drive, does it overwrite my existing pictures? No, it doesn't. Every time you press the Copy button, it creates a new folder for your files and increments the folder number by one. At one point, I forgot whether I copied an SD card to the Teac portable drive. I just hit copy again and later found out I copied it twice. With 40GB, I could do that. At the end of the vacation, I took a total of 6GB of photos and video (640x480 for video and used postcard 1600x1200 on the photos) on the portable drive. I still had 34GB left on the portable drive. Yeah, blew my mind too. After my vacation, I sat down at my computer, plugged in the USB drive with the supplied cable , and downloaded the photos and video to my PC. The Teac served as a portable hard drive. Nice! Disney figured it out as well. After leaving a ride or passing by a photo location with a Disney character after each picture was shot, we were presented with a Disney card about the size of a credit card. Disney called this their PhotoPass. You can receive one or get a complete collection, but once you had one, you could hand the card to the photographer or slide the card in and attach the photos to the card for viewing the pictures later. On the back of each card, there is a keycode. 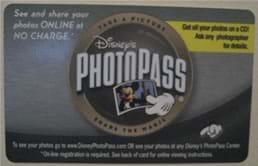 You go to www.DisneyPhotoPass.com and type in the set of four codes and voila! You receive your pictures with an option to add bells and whistles...for a price. Hurry up, though. The photos only last for 30 days. Make your decision which prints you want or you'll lose 'em. 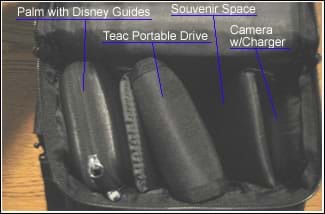 Disney understood that hauling around a tripod, camera equipment, and various accessories, oh...and setting everything up, can be a pain. Hiring a professional photographer to take the pictures is definitely a better way to go, which is what Disney did. At each photo location with a Disney character, a personal photographer is attached to the character. The professional takes the picture and hands you a PhotoPass for you to keep. Quite easily. Here is a shot of how I carried everything around in one neat little camera bag. I stored the SD cards in a portfolio wallet and placed the wallet in the front of my camera bag. After being on vacation for two weeks, these mobile gadgets were perfect to capture as many photo or video moments as needed. If you've been on vacation before, how do you temporarily store your photos and video until you return home? Post your comments below.